Get a fast free quote! Material bins – Increasing demands for moisture control of incoming materials because of accelerating automation in the precast industry requires controlling the amount of rain or snowfall accumulating in material bins. Our shelters provide weather protection with heavy duty vinyl covers that still allow natural light. 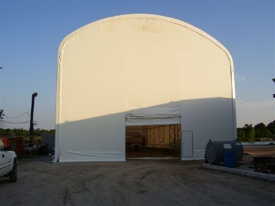 Casting and finishing yards – Fabric covered steel buildings can protect all mold beds, castings and workers from the ravages of sun, rain and extremes of temperatures. Kilns – Control the curing of parts by introduction of heat or steam, contained within our rugged shelters. Maintenance Shelters – Quarries cover hundreds of acres, and require maintenance facilities near the quarry work. Shelter Structures has provided relocatable structures that will move with the work. All facilities have high equipment maintenance demands. Our maintenance buildings make ideal sheds for maintaining everything from fork trucks to half million pound dumps and dragline buckets. They can also be purchased with heavy duty rubber wheels, so you can either move the molds and parts in and out of the shelter, or move the shelter out of the way of molds, parts or picking equipment. The versatility of maintenance buildings from Shelter Structures, Inc will provide your business with maximum operating flexibility for now and years to come. 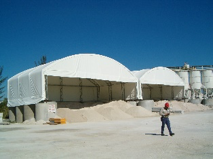 Contact Shelter Structures, Inc. to discuss your maintenance buildings needs.